Discussion in 'Other Tools' started by dancom, Jan 10, 2019. Santa was good to me this year. Even if he was a bit late. 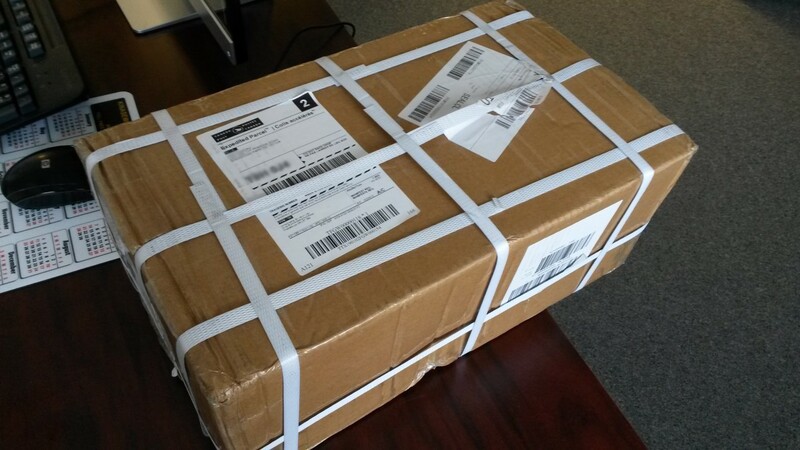 I received my CNC laser kit today. 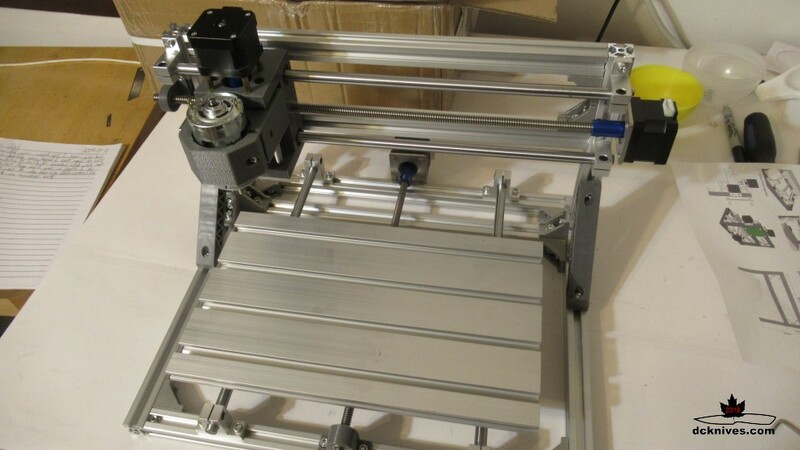 It's a basic 3018 three axis CNC router (think Dremel size collet) and this particular kit comes with a blue (450 nm) 5500 mW laser. It connects to a USB port on a computer and gets GRBL instructions from there. 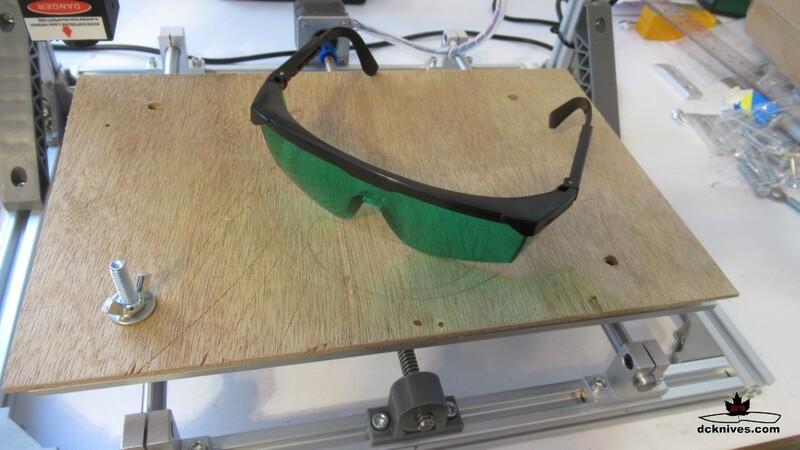 This is not a $4000 industrial laser. Rather 1/10th that cost including shipping off of eBay. Ok, it's not going to cut much of anything, maybe thin plywood or polycarb for making patterns. However, for marking steel, wood and leather I am hoping it pans out. 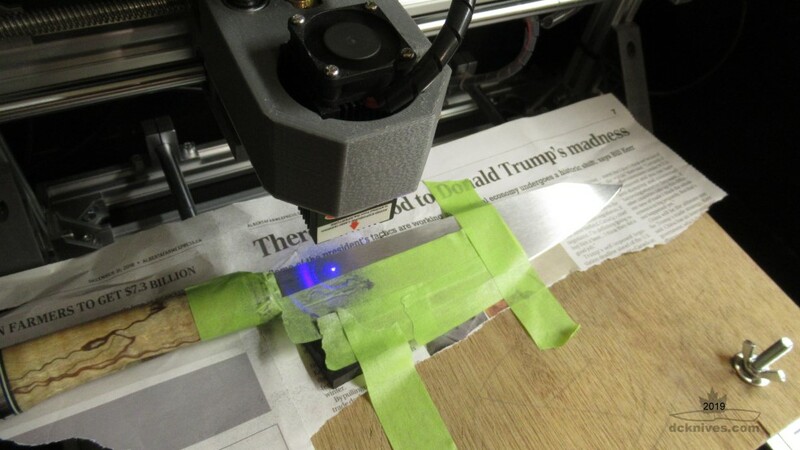 After viewing a bunch of videos on YouTube, it seems feasible for marking on stainless steel with a relatively low powered blue laser given a suitable coating is applied to the steel before marking. 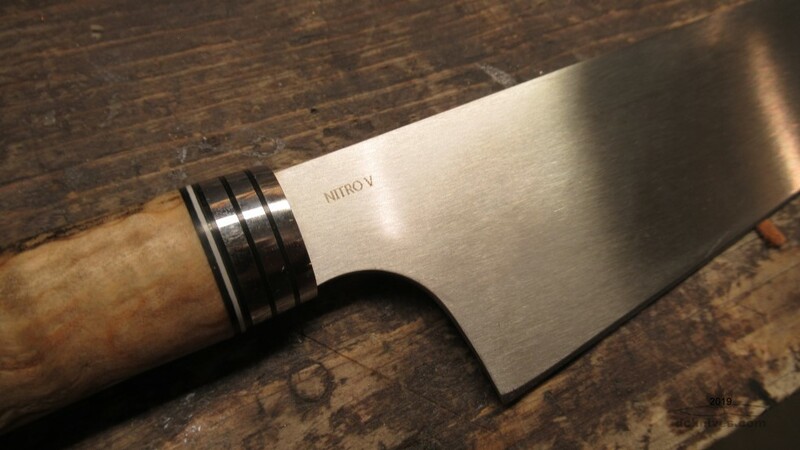 This being exactly what many knifemakers would use it for. Now one could add "Happy Anniversary" or "Wanker's Automotive" without having to have one off stencils made and electo-etching. As the laser essentially bounces off of shiny surfaces, some special non-reflective coating needs to be applied to steel. And of course special safety glasses just in case it bounces into one's eye. Engraving coatings range from $100 Cermark aerosol can to dry moly lube or even Dijon mustard reportedly works on stainless. Mmm burning Dijon mustard. For the benefit of our members, I will be doing some tests and hopefully give some insight into what an inexpensive unit can and cannot do. This is the video that sparked my interest and got me emailing the North Pole. Here's to getting it built and having no missing parts! krash-bang and PeterP like this. Cool stuff Dan. I recently bought a 3D printer. I specifically chose the most "open source" one because there's all kinds of aftermarket add-ons from everywhere. 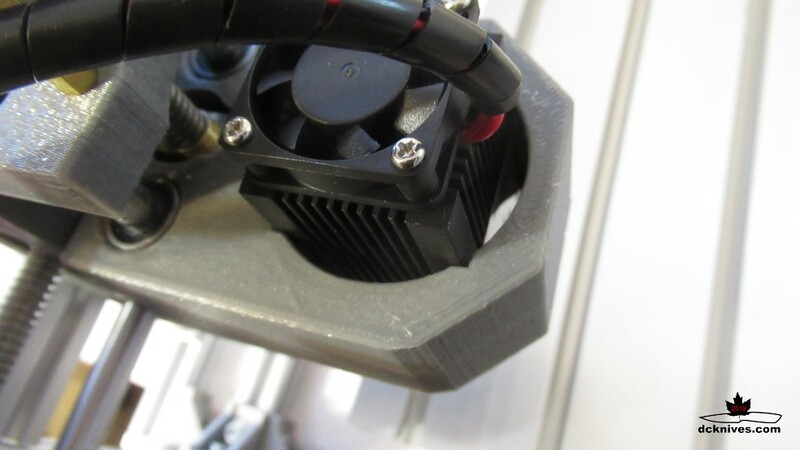 They even have a 3d printer head and/or a tiny mill head you can add to it. It's not on the same scale but, I too hope I can etch/engrave some metal/wood. The build part comes first. 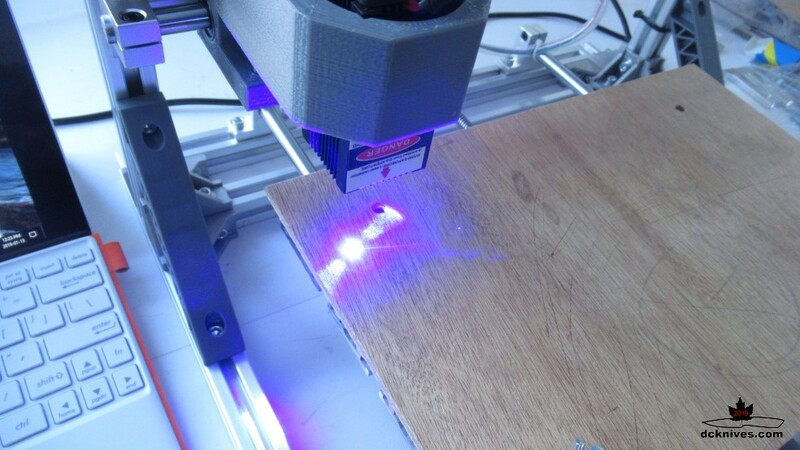 The product is branded as the Woodpecker 3018 CNC Router w/Laser. The packaging is pretty well laid out with two layers of foam tray. Nothing appears to be broken or bent at this stage. Unpacking left me with lots of little clear plastic bags. Nothing identifying what's in them but we should be able to figure this out from the pictures right? 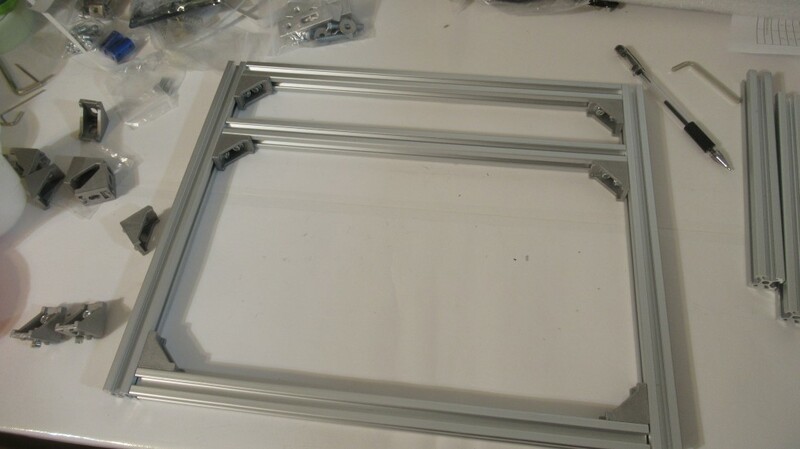 The frame is pre-cut extruded aluminum akin to 80/20. Some metric hex wrenches are included. 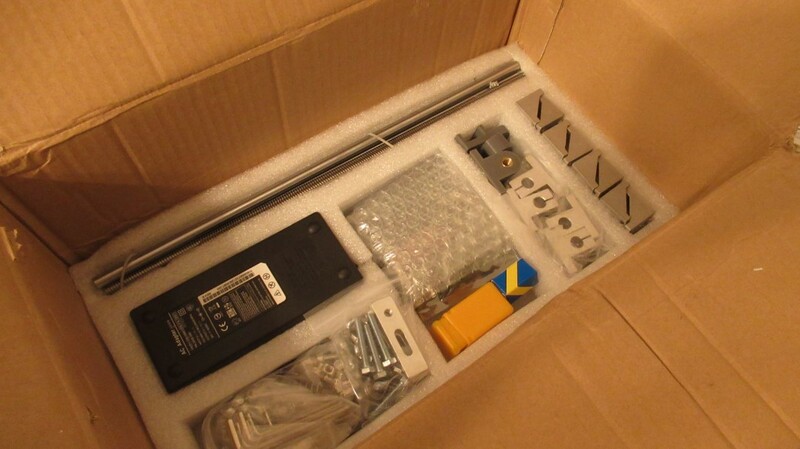 The stepper motors, router motor and laser are fitted well into the foam and protected for shipping. In the box there is a little CD with files. 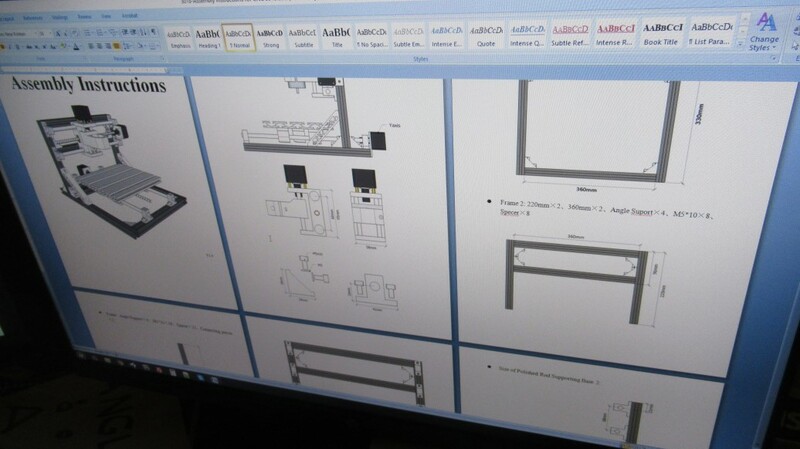 One of the files is a Word document that has some CAD images and rudimentary descriptions and is labelled as "Assembly Instructions." Getting the hang of putting the angle blocks in. These are fiddly, but work well to secure the frame pieces squarely. In addition to the hex wrenches, a small square and ruler are required. As the build progresses, the tee nuts can be a little tricky in tight corners like this. Having someone with small hands to help is a plus. 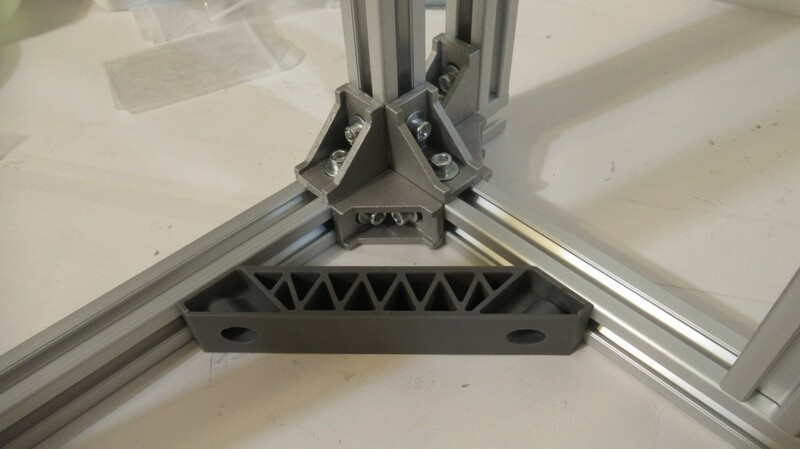 The table is a surprisingly hefty chunk of extrusion. There are four slide bearings that roll along the polished rods. Making sure the rods are as perfectly parallel as possible is the big challenge here. As there is no step-by-step it was kind of trial and error to get the table sliding smoothly, yet not loose on the slide bearings. 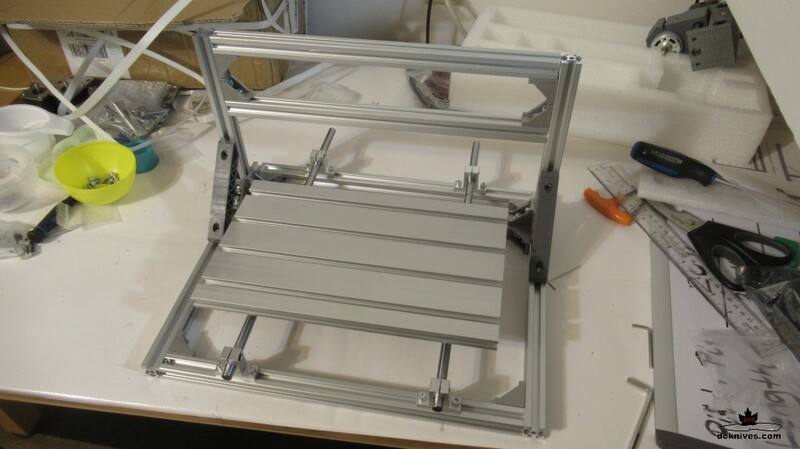 Here the base, sliding table and gantry are assembled. About three hours in so far. I look forward to getting the rest of it finished this weekend. Got some more done last night. Things are almost ready for powering up. 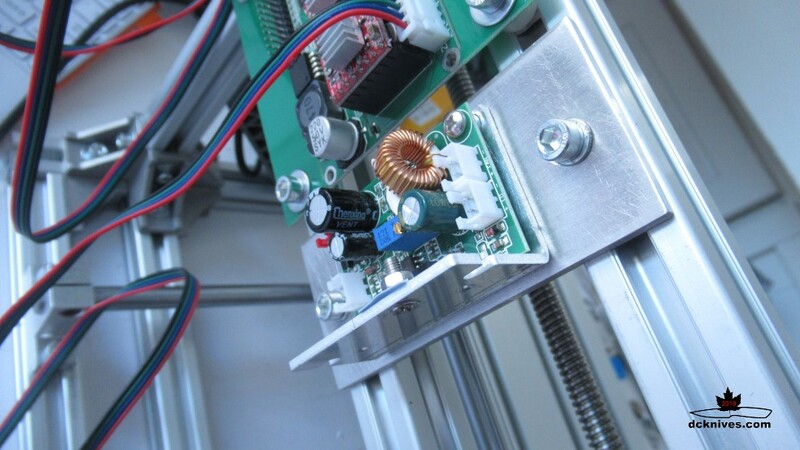 The stepper motors are coupled to the lead screws with these blue anodized couplers. 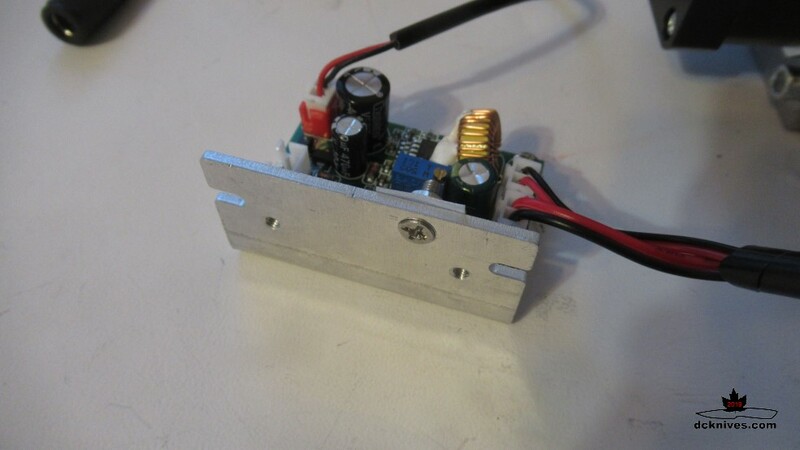 As there is nothing in any graphics indicating where to position the motor's connector I aimed them all sort of towards where the PCB is supposed to go. 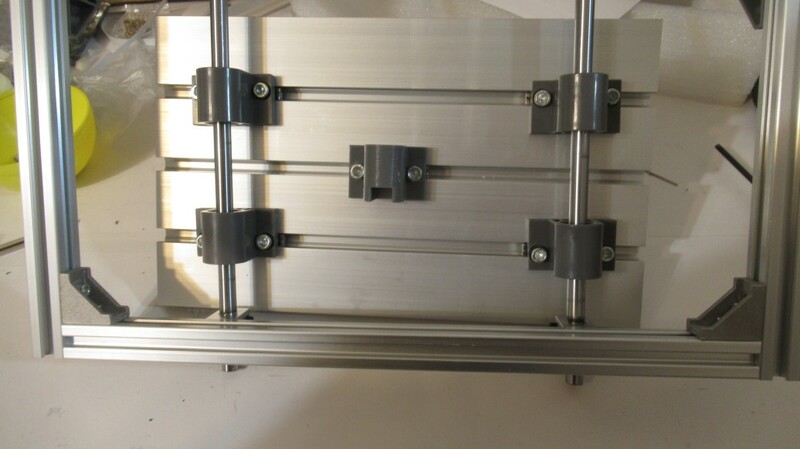 The whole traveling head assembly slides on the X axis on two polished rods driven by the X stepper motor on the right side of the gantry. This is the GRBL 0.9 "Woodpecker" board that mounts on four nylon standoffs on the backside of the gantry. 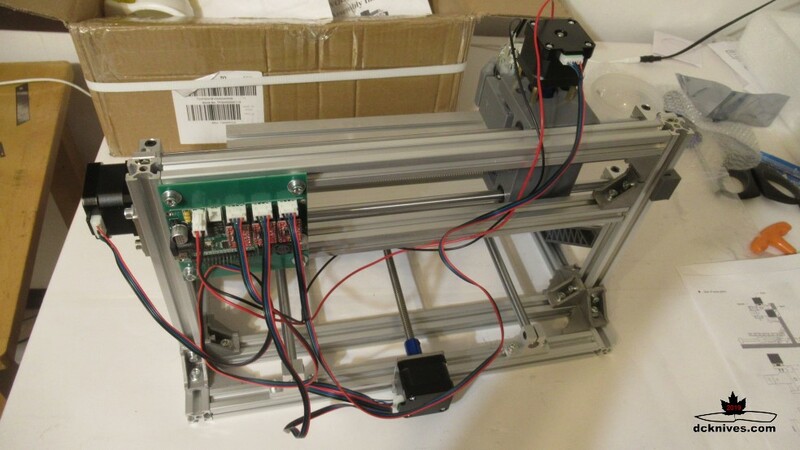 It has connections for the motor, three stepper motors and a laser. 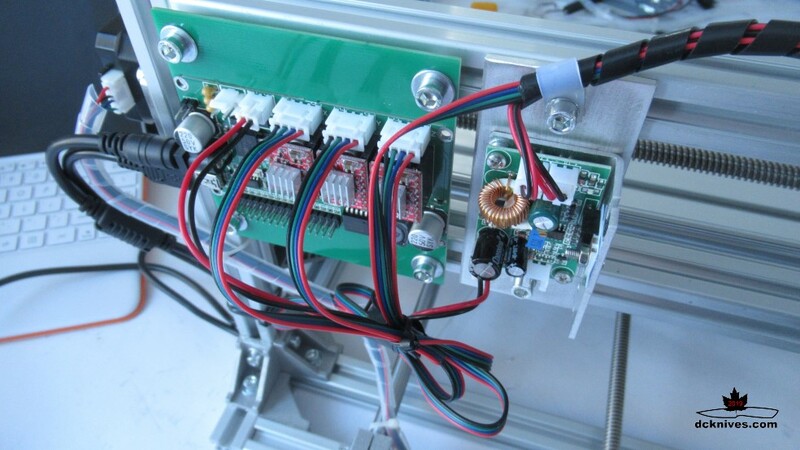 Wiring is as simple as plugging in the motor and the three stepper motors. It needs some cable management for sure. Note there is a place to connect the laser module on the PCB, but no apparent way to mount the laser on the traveling head. Hmm. Contacted the vendor last night. Probably going to have to rig something up. Really looking forward to see what you can do with this Dan! Definite gamechanger for the customization side of things, thank you for blazing trails. A couple of issues in the build. 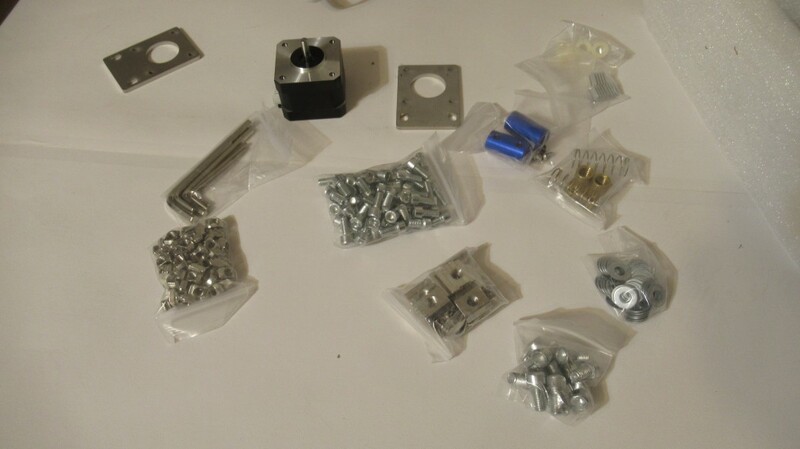 When testing the movement of the three axis I found that it was very hard to turn the table "Y-axis" motor and lead screw. After disassembly, I found that the lead screw nut was not installed correctly at the manufacturer. 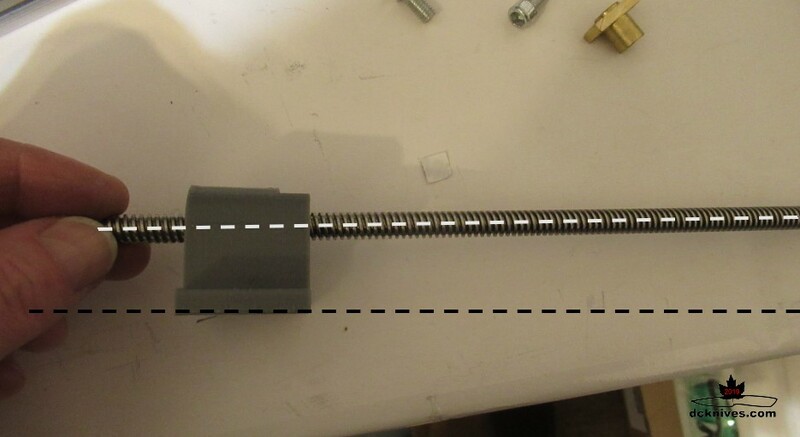 This misalignment causes the lead screw threads to bind and make it very difficult to turn. To remedy this, I threaded the lead screw into the nut and heated the screw with a torch close to the nut. This softened the thermoplastic just enough so I could nudge the nut so the lead screw and make it parallel with the base of the nut holder. After digging deeper into the supplied CD ROM, I discovered that the laser is to be mounted where the spindle motor goes. This wasn't what I was expecting. 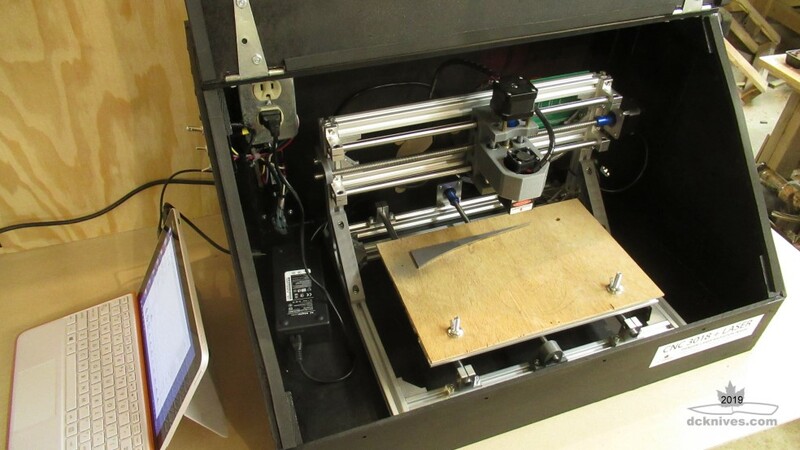 This means the machine can be setup either as a laser or a router depending on which tool is installed and plugged in to the board. 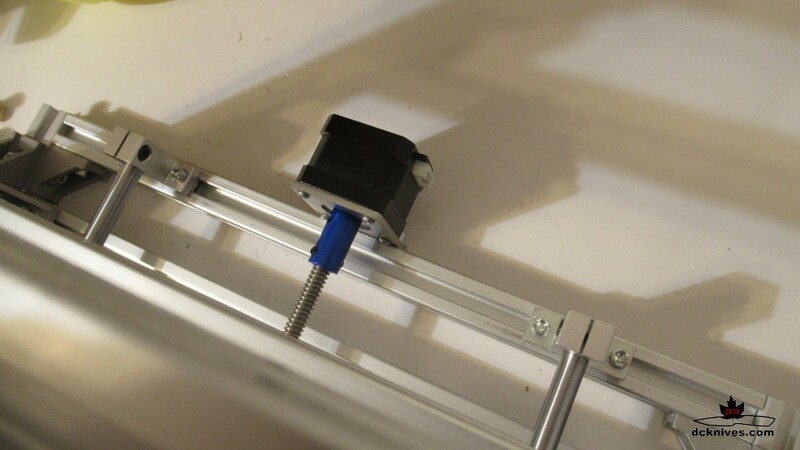 I may look into making a bracket for the laser module and attaching it to the side of the motor clamp. 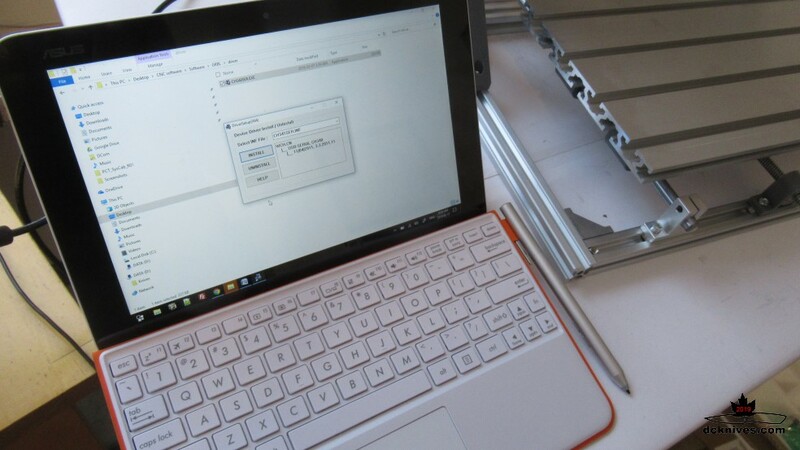 This way there is only software switching between tools. 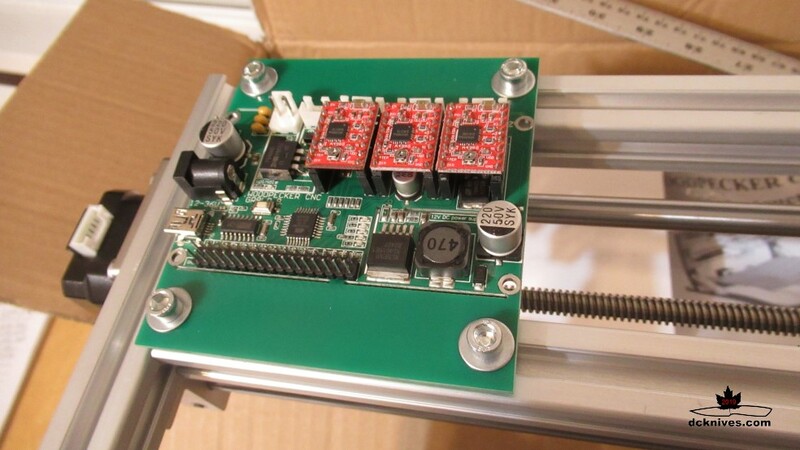 The last issue to solve is how to mount the power supply board for the laser module. This will have to be mounted on a larger plate then mounted on the gantry rails. A little bit of cable management. The kit does come with a few nylon cable ties, but no spiral wrap. The power supply and USB cable plug in the left side of the board. I am concerned about breaking the USB connector of the circuit board if the cable gets yanked so I tied them down with cable ties. The software that comes with this model is called Litefire. It automatically detected the COM port for the USB on my tablet. I tested the laser on low power to focus the beam. The wood began burning immediately on low power. Works ok on wood. This is at the lowest power setting and a speed of 2500 mm/minute. 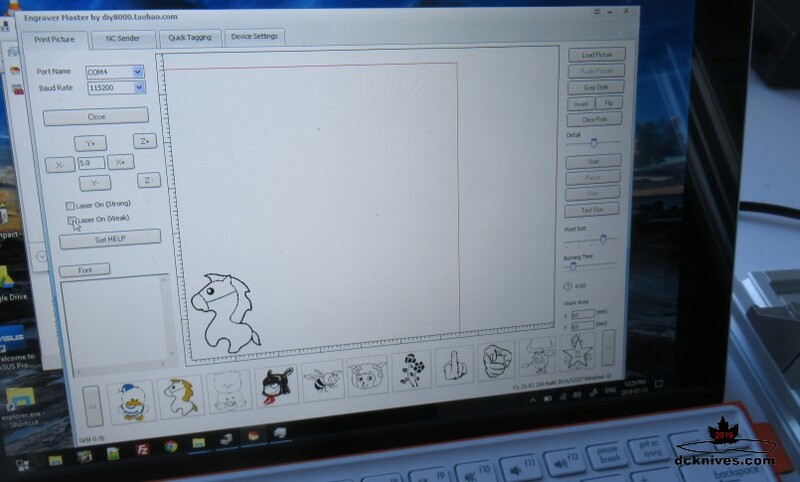 Still figuring the software out. It takes JPEG/JPG type files (which is odd because JPG is a large pallet full colour format and a laser really needs black and white images). I took one of my logos, reduced it to around 100 pixels x 50 pixels and saved it as a JPG. I found that running too slowly, say the default of 600 mm/minute simply burns everything to a char. For each application some experimenting will be required to get the speed and power correct. This could certainly be used for branding a saya or wooden knife presentation case. do you think it would be precise enough to burn art on a wood scale for a knife? Absolutely. A curved surface would be a little more challenging as the the focus of the beam will change with the distance from the laser. I was experimenting a bit more last night I was able to get the beam "dot" to about the size of a pin p r i ck. What's that about 0.1 mm? Leather art anyone? I'll post more of what I am experimenting with soon. ⚠I've been doing some more reading about laser etching with mustard. It appears as though the nickel in the stainless steel is reacting with the isothiocyanate in the mustard and doing a sulfur bonding. Unfortunately, Martensitic stainless steel datasheets I have looked at indicate zero to little nickel in the composition. So the test will be on some good old Austenitic stainless like 304. That's pretty awesome Dan. There's at least a handful of things that I'd love to try with that. I did a few more tests last night. Trying to learn the speed and power settings for different material. Leather needs to be burned at a higher speed or it obliterates the small loops in the letters together and small Cs and Os look like Es. This I did at 7,000 mm per minute, lowest power setting. This is my seal on a piece of scrap koa. I slowed this down to 3000 mm/minute, lowest power setting. The seal itself is about 1" in diameter so you can get an idea the scale. So far for wood and leather I haven't taken the laser power off of the lowest setting. I am waiting to get some CRC Dry Moly Lube in. When I have it, I will crank the power up and try marking on steel. Oh man that's sweet. Really gives it a pro look too. You'll be able to do a lot of cool decorative stuff and even personalize things... right on. Exciting for sure. It's been a little while, but I have some results of my first dry moly lube run. 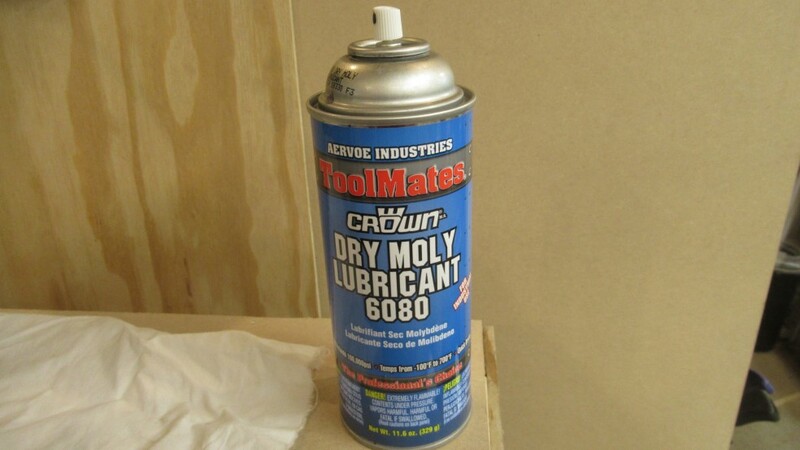 I wasn't able to get my hands on any CRC brand Dry Moly Lube as prescribed by others as a useful marking product, but I did manage to have some Crown 6080 Dry Moly Lube ordered in at Acklands. The MSDS claims that it contains 3% to 7% molybdenum disulfide. 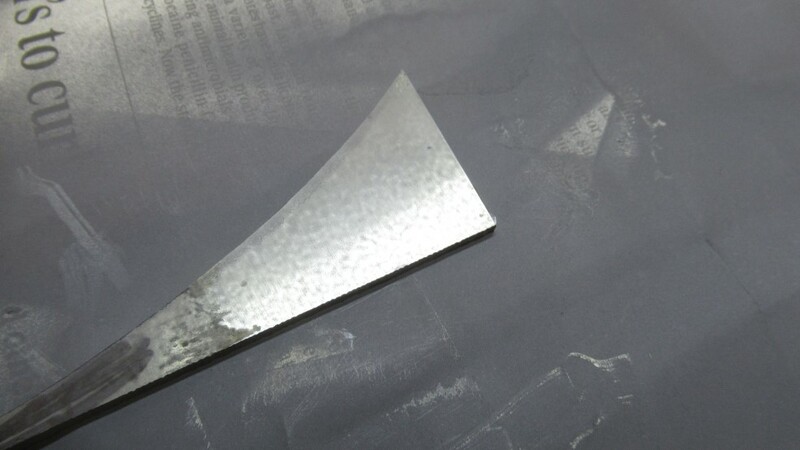 This is a single coat of lube on a piece of AEB-L steel that has been cleaned with 220 grit sandpaper. After two passes at 300 mm/minute at full power and a wipe with acetone, the results are in. 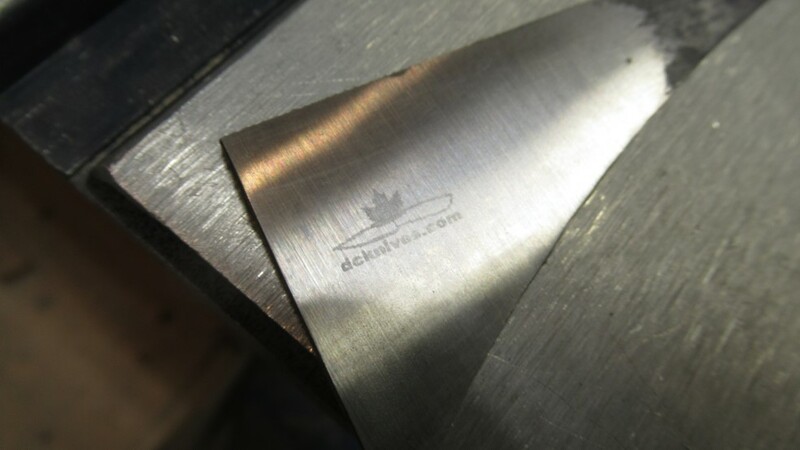 Yes, it will mark stainless steel. Is it going to blow your socks off with amazing crisp black lines? No. - Slowing the laser down further. - Source a proper marking product. I'll also see about upping the power of the laser module. Apparently 15 Watts is working well on stainless. krash-bang and Bluefish like this. UPDATE: I made some adjustments to the laser speed and did some testing. Also, the laser has a new home. I made an enclosure with exhaust port. This is pretty much sealed off so stray laser light isn't bouncing around the shop. You can see some pixelation in the marking. 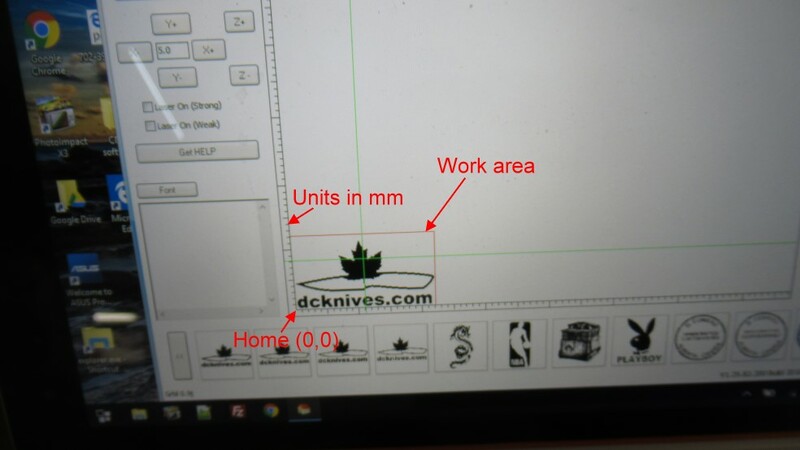 I think this can be improved with the "Detail" value in the software. However I am uncertain as to what this number actually does. The logo on the opposite side also looks a little pixelated when viewed up close. - focus laser to the smallest dot possible. - set the "detail" setting to 75%. Some more work to do, but the marking contrast has greatly improved with the slower speed. I'll try a few more things and report back. Mythtaken, krash-bang and PeterP like this.